Violinist Kimberly Fisher joined The Philadelphia Orchestra in 1992, and has served as Principal Second Violinist since 2002. Her path to her current title included 5 consecutive winning auditions, the majority of which were unanimous decisions by the committee and Music Directors. She has appeared as soloist with numerous orchestras including repeatedly with The Philadelphia Orchestra, The Vancouver and Victoria Symphonies in Canada. As recitalist and chamber musician she has performed across the United States and Canada, and in many countries in Europe, Asia and South America. Kimberly has appeared in chamber music settings in prestigious venues such as Carnegie Hall, The Mogador Theater in Paris, The Kimmel Center, The Great Hall of China; and in collaborations with internationally renowned artists such as Wolfgang Sawallisch, Cristoph Eschenbach, Jean-Yves Thibaudet, and many others. Ms. Fisher has been awarded multiple Canada Council Grants and was invited to perform as soloist at the Governor General's concert in Canada. She has been featured on National Canadian Radio and on Canada's CBC television. Her teachers included her father, Lawrence Fisher, Yumi Ninomiya-Scott, Aaron Rosand, David Cerone and Jascha Brodsky. In 1997, Ms. Fisher co-founded "The Philadelphia International Music Festival," a highly successful summer music program in residence at Bryn Mawr College, to encourage and inspire musicians of all levels. Originally just for string players, the festival now includes all symphonic instruments plus piano, and features innovative specialty programs to help students prepare for auditions, improve practice, and address performance issues. PIMF includes students of all ages and all levels who attend from around the world to study privately with musicians of The Philadelphia Orchestra. 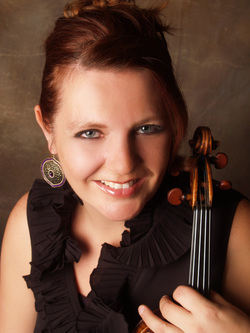 Kimberly is an active pedagogue whose students have performed as soloist with major orchestras, attended distinguished music conservatories, perform as members of professional orchestras and have won many awards and competitions. Her energetic, communicative teaching style has led to invitations to present master classes, lessons and seminars around the world.